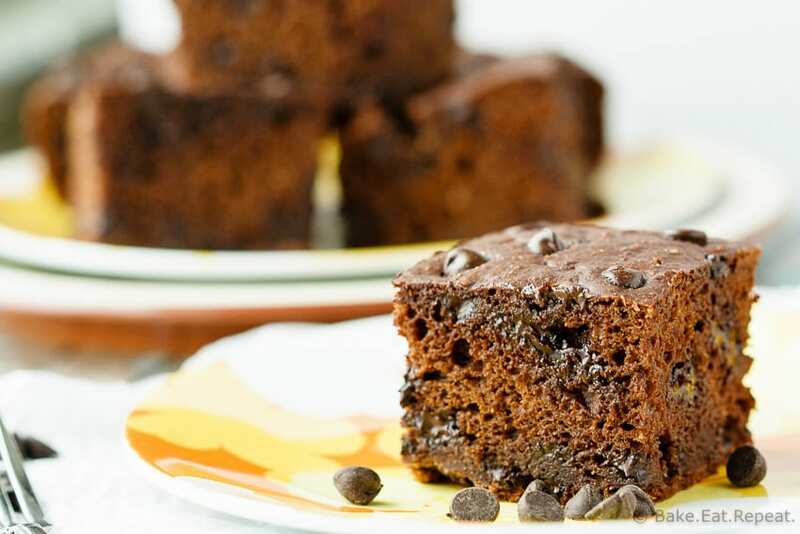 Healthy Chocolate Banana Snack Cake - Bake.Eat.Repeat. Quick and easy chocolate banana snack cake that you can feel good about putting in the kid’s lunch boxes! Super healthy and they won’t even know it! I have never made a snack cake before. I know they’re a thing. I see recipes for them all the time. I guess when I think “snack”, “cake” isn’t usually the next thing that jumps to mind. That needs to change. I need to think of “cake” and “snack” as belonging together because it is a wonderful thing. 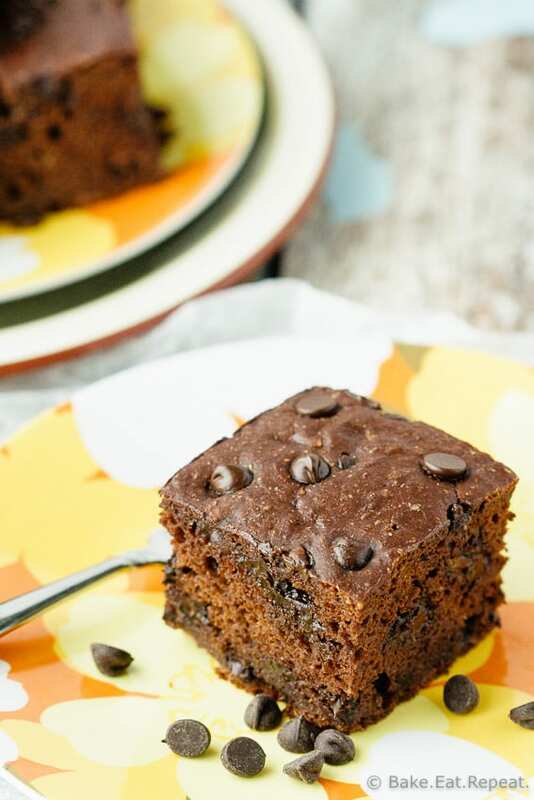 Especially when it’s as tasty and as healthy as this chocolate banana snack cake is. My kids had no idea that this was healthy. They were just flabbergasted that they were being given chocolate cake for a snack instead of a piece of fruit. I happily ate some myself, because who’s going to say no to chocolate cake? Especially when it doesn’t negate the run I just went for? You can’t say no to that. Plus – chocolate. Chocolate and healthy. All in the same wonderful snack cake. That, my friends, is a beautiful thing. Which is why snack cakes need to become something I make more often. Especially when they are as healthy as this one. No butter or oil, just some plain Greek yogurt plus the bananas for moisture. No refined sugar, and only three tablespoons of honey to sweeten the entire cake. Plus, it’s made with whole wheat flour. I suppose there’s the sugar in the chocolate chips, but I think you could probably even omit the chocolate chips (or reduce them) if you want it to be completely free of refined sugar. (Of course, those melty chocolate chips in a warm piece of chocolate cake are maybe the best part, but that’s just my opinion!) And it can be in the oven in less than 15 minutes and stays moist for days. Fast, easy, tasty and healthy. That’s something that needs to be made more often. Because like I said, healthy chocolate banana snack cake is a wonderful thing. 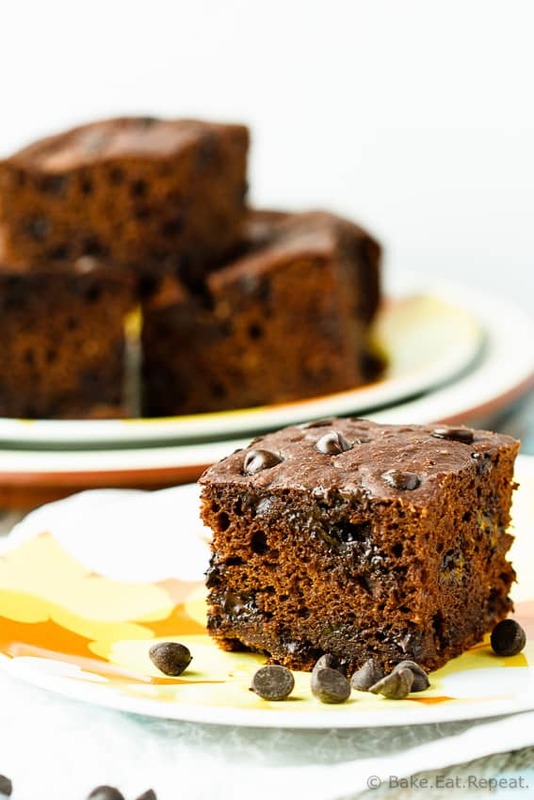 I also shared this healthy chocolate banana snack cake recipe over on Food Fanatic. Are you sure the cooking time is correct? Mine was overdone at 40 minutes? I hadn't made this in quite a while, but it did look like a long bake time so I immediately went and made it to see. And you are right, the time is wrong. It should be 28-32 minutes. Mine was done perfectly in 30 minutes. I'm so sorry. I'm not sure if it was a horrible typo, or if it was because I was in between houses when testing this recipe and tested it with a gas oven which did seem to bake a little differently - but that bake time was definitely too long. Again - so sorry, but thank you for bringing it to my attention so I could test it again and fix it. I'll get the recipe card adjusted. Haven't tried this yet, but can't wait. What's the calorie count per serving? It's 106 calories per serving. For any of my recipes that are also on Food Fanatic, you can go to the post on Food Fanatic (it's linked above the recipe in my post) and the recipe card over there shows the nutrition information. I don't have yogurt on hand. What could I substitute with. I gave sour cream and kefir in the refrigerator. I think that sour cream would be a good substitute in this! How would you make this gluten free? Hi Rhonda, you could try replacing the flour with a gluten free flour blend, but as I've never tried it, I couldn't say for sure how it will turn out.